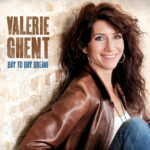 Valerie Ghent’s latest solo album skips lightly between soul and jazz, r&b and funk. Moving between R&B, jazz and soul seems effortless for smoky-voiced Valerie Ghent, who has been steeped in the stuff since her days as a keyboardist and recording engineer for New York’s soul duo Ashford & Simpson. She’s a busy woman, dividing her time between recording, dabbling in fashion with West Coast Leather, and spending time in China studying internal martial arts. Day To Day Dream is the latest solo effort from Ghent, a stellar sixty minute effort that slips and skips between smooth, Gershwin-tinged jazz, swinging soul, and sunny ska. Its a confident and varied album, a perfect showcase for Ghent’s chops as a pianist and for her tremendous vocals. Ghent’s got quite a voice, and it’s her most powerful weapon on the album, hurtling into the stratosphere or falling into a low croon at will. Ghent howls, growls and snarls with precision and feeling. Her band is made up of no slouches either. They’re all industry talents and they are more than up to snuff. Recorded live, the band sounds intimate, and the interesting arrangements bring in elements of harmonica, saxophone, trumpet, and some stunning bass. Day To Day Dream is at its best when settling into a jazz and R&B groove. “He’s My Man” sounds exactly like these songs should–smoky, lush, romantic. Bassist Booker King is the hero on that track, giving the song the depth it requires, and it’s a standout track among many. “Phased” is a sustained five minutes of gorgeous melody, and “Run, Run, Run” is a bright, sparkling splash of fun in the middle of the achingly earnest jazz songs and swinging soul. Meanwhile, coffee houses should be scrambling to put her “Love Enough For A Lifetime” over their speakers…. In the face of some awesome songcraft and performances, there’s no question that this album is some quality work. And although it clocks in at 60 minutes, Day To Day Dream is varied enough that it doesn’t overstay its welcome. Valerie Ghent is obviously a talented, powerhouse singer/songwriter and if the album has anything to say, it’s that.